Seeking All Ancestor ~ Searching For Ancestors Everywhere! Genealogy, the hunt for those elusive relatives. It has us digging thru musty old court records, bugging our relatives for the latest news on distant relatives and searching phonebooks everywhere we travel for a familiar last name. There are no length we won't go to find that last bit of information. On this site I chronicle my search for two groups of people and share the best sources of information I have found during my research. My Family Project is based on a typewritten genealogy from my Great-Aunt Ida Scofield. I am tracing two brothers, Daniel Scofield & Richard Scofield, who settled in Connecticut in the 1640's. It quickly expanded to include my husband's family, the Crossno's and my father's family, the McIlmurray's. To read about the families I am researching along side the Crossno, McIlmurray and Scofield families check out my Family History Project home page. My Royalty Project was born of my love of history (and romance novels) I am researching all the European Royal Families. I am tracing the genealogy of the Houses of Belgium, United Kingdom, Spain, Russia, Denmark, Norway and others. 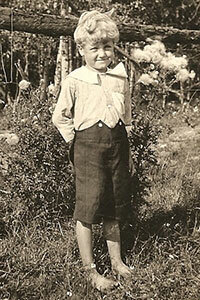 My grandfather, Wendall Thomas Scofield at age 5, abt 1923.